“A child and parent are playing outside, when the little one loses a favourite mitten. The happiness is temporarily shattered, and they go back inside. The child looks through a chest for a replacement pair and finally discovers a mitten that will do. Outside again, they find the lost mitten and also see that it has been discovered by a bird (seen at the beginning of the story), which is now incorporating a piece of the colourful yarn into its nest. With the lost mitten and lost smiles found again, and mittens shared in novel ways, joy is restored to a perfect winter day. Poetic and spare, but deceptive in its simplicity, this story extends deeper than the few moments it poignantly describes. Stunning multimedia art by Irene Luxbacher gives young readers detailed worlds to explore.” — Scholastic Canada catalogue. 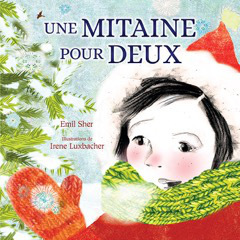 Mittens to Share was published in Fall 2016 in French and English. Emil was delighted to have worked with senior editor Anne Shone, who — with New York-based Cheryl Klein – shaped Young Man with Camera. The book has been gorgeously illustrated by Irene Luxbacher.